You can raise a Black Swallowtail Butterfly. I have found the black swallowtail butterfly to be the second easiest butterfly to raise....second only to raising Monarchs. These gorgeous butterflies are quite common in my butterfly garden. 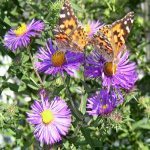 They are very easy to attract with nectar plants such as Zinnia, Joe Pye Weed, Purple Coneflower, Phlox, Butterfly Bush and more. The Butterfly Stages are interesting as you will see in the butterfly pictures below and in these Black Swallowtail life cycle photos. 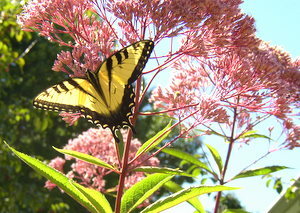 There are over two dozen varieties in the Swallowtail Family of butterflies in North America. 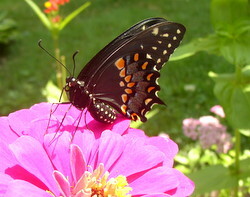 The Black Swallowtail Butterfly is found from Southern Canada to northern South America. It is most common in the Eastern, Central and Southwestern parts of the United States. The last brood of Black Swallowtails in late summer overwinter in the chrysalis stage. 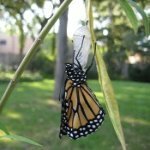 They are first seen in April and May after emerging from their chrysalis. There are 2 or 3 broods (generations) each summer....the second one emerging around mid-June and another in August or September. on Joe-Pye-Weed in my backyard. In order to attract Black Swallowtails to your backyard you need to have their host plant (caterpillar food) in your garden. 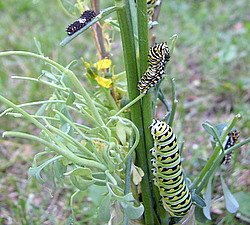 They have several different plants that the caterpillar will eat. Their host plants include parsley, dill, bronze fennel, Queen Anne's Lace and Rue to name a few. Rue is the all time favorite larval food of the Swallowtails in my garden. Rue can irritate the skin when touched (I haven't had a problem with this) and can make you sick if eaten, so be aware of this before planting it. 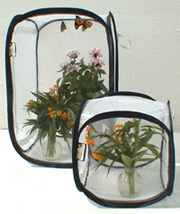 Interested in creating a black swallowtail host plant garden? Here are some seeds for you to grow to attract the black swallowtail butterfly to your backyard for laying its eggs. The Black Swallowtail caterpillar looks very different as it molts and goes through it's various stages. The early stage on the top left is black and white, to mimic bird droppings. Notice the other two later stage caterpillars have different patterns. 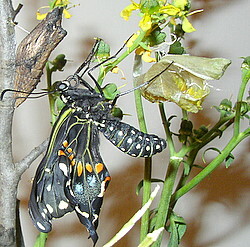 The Black Swallowtail chrysalis is either brown or green in color as you can see in this picture. It depends upon what the caterpillar attaches itself. 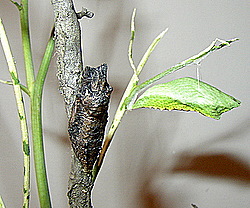 Notice the brown chrysalis on the left blends into the stick and is well-camouflaged. This Black Swallowtail that just hatched still has crumpled wings. The body is plump with fluid which will be pumped into its wings. Notice the empty chrysalis to the right and the unhatched brown chrysalis to the left. If you do not have Black Swallowtails in your area, choose a Swallowtail that is found where you live. Research it's host plant and try your hand at raising it. 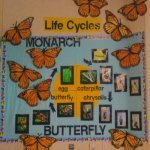 If you decide to try raising caterpillars inside so you can observe the miraculous butterfly stages "up-close", check out these great caterpillar cages.